If you have a tooth that needs help, dental crowns can be an excellent option. Dental crowns work to protect and strengthen teeth. They are a cap that is placed over a tooth to cover the top and sides of it. This creates a protective barrier that is extremely durable. Crowns replicate the form and function of natural teeth. Your dentist can design them to match the size, feel, and shape of your existing teeth – so they fit neatly into your mouth and you don’t have to worry when you bite or chew. Crowns are flexible. The color, shape, and size of a crown can be altered so that a crown can give you back your beautiful row of pearly whites. Crowns can be used on exceptionally large cavities and thus avoid a root canal procedure. Crowns are a bargain! They can help you avoid other dental procedures that are more expensive. Longevity! A crown’s normal lifespan is from five to ten years and they can last even longer. Many insurance plans cover crown replacement after five years, so your only expense for the crown is the initial procedure. Dental crowns are placed over teeth for good. Unlike other appliances they do not normally shift or break. Other appliances can crack, drop out, or be lost, but crowns stay there! Crowns can also be used to cover weak teeth and eliminate the need for the tooth to be pulled. A crown can restore a tooth’s original strength and function. 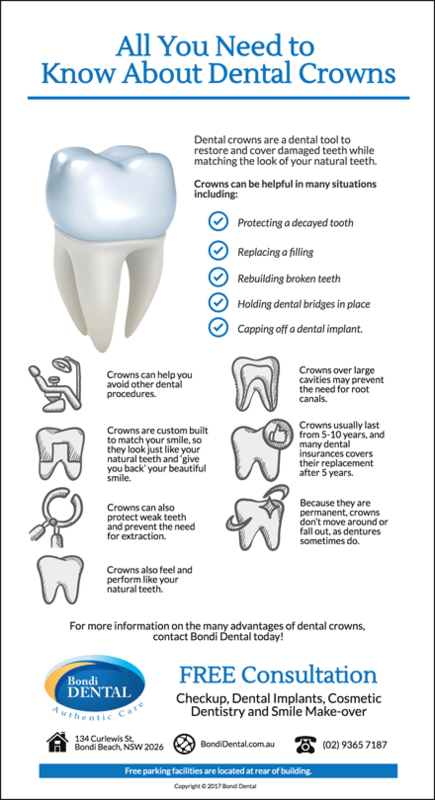 Dental crowns can be part of your path to better dental health! Visit your Bondi Dental Office to learn more! Call us on (02) 9365 7187 or book your appointment online to claim your FREE Smile Makeover and Cosmetic Dentistry Offer.